What would the motivation be to create a global propaganda machine? Would $217,000,000,000,000 Trillion in global debt be enough motivation for the financial elite to create a massive propaganda machine in order to harvest the hard earned energy of the masses? Best - selling author Orrin Woodward describes it best in ‘The Financial Matrix,’ “The Financial Matrix is a system of control where the elites have monopolized the money supply. This allows the modern aristocracy to create money out of thin air to loan to the masses for houses, cars, and other luxuries. Predictably, even though the elites created the money without labor, the masses must then pay back the mortgage over the next 30 years by laboring profusely." On the surface, the current propaganda machine appears almost insurmountable. The media is now owned by the elite. Business Insider reports: almost all media comes from the same six sources. 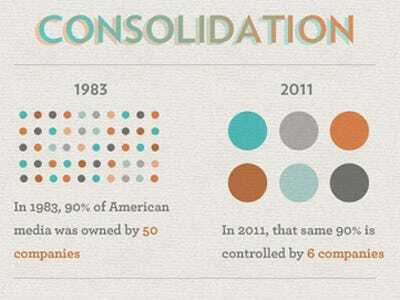 That's consolidated from 50 companies back in 1983. In the best - selling book, ‘The Financial Matrix,’ Orrin Woodward writes, “Unbelievably, the latest research reported on economist.com reveals that 50% of Americans (the numbers across the developed world are similar) have zero net worth – not even a penny… nothing to show for years of hard work.” Are you being harvested by the financial elites only to service ‘The Financial Matrix’? According to ‘Yahoo / Finance,’ “Seventy-eight percent of full-time workers said they live paycheck to paycheck, up from 75 percent last year, according to a recent report from CareerBuilder… Overall, 71 percent of all U.S. workers said they're now in debt, up from 68 percent a year ago, CareerBuilder said." This is what Leadership expert Orrin Woodward calls the ‘Broke’ quadrant. However, with the amount of global debt I’ve sited previously in this article, clearly, a huge percentage of the population is financing their lifestyle. Woodward describes this quadrant as the ‘status’ quadrant. I remember feeling exhausted living paycheck to paycheck all the while working 65 hours a week over a twenty - year period. Who else is on a precipice of trading time and money to have the houses, cars, and consumer debt, all the while managing payments? I suspect most of us. To service the debt, the principle to interest ratio that is thrown down the infinite pit of ‘The Financial Matrix’ is unfathomable.